In this video, we are going to look at graphs of exponential functions. grows steeper in a positive direction as x values increase after plotting points as shown in the video. grows steeper in a negative direction as x values increase after plotting points, and is a reflection over the x-axis of the first graph. 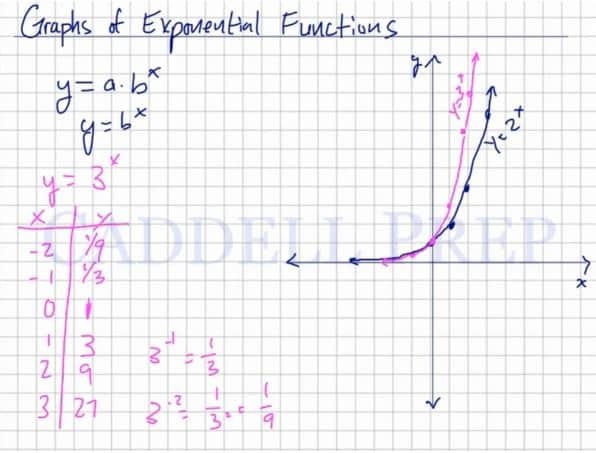 Let’s go over graphs of exponential functions. First of all, what is an exponential function? Something that should stand out is that is any exponent. And and are constant. Let’s first look at functions that . So, we’ll solve for and . Let’s look at some specific ones. The thing I want to point out is when then . When we graph the positive exponent, it will not be a straight line. It increases at a much higher rate. It even curves up drastically. When we graph the negative exponents, it will curve but will not touch the -axis. Because even if the exponent is negative, it just changes to a fraction and not a negative number. So this is the basic graph of an exponential fraction. Let’s look at the graph of . Let us have the same points here. Let’s start with then . This one is very steep on the positive exponents and very low on the negative exponents. But still won’t touch the -axis. Let me change the values a little bit. Again let’s start with . If you look at it, it’s a mirror image of our first example. It will be very close to the -axis. The negative will be reflected in the -axis. So let’s start with again, because any number raised to the power of is . Compared to the first example, this graph is reflected in the -axis. We have a constant that’s greater than raised to an exponent. It will constantly raise on one side if the exponent is greater than . Since you’re multiplying it by itself over and over again. Whereas with the other one, we have a fraction. Which is less than one and raised to an exponent. When multiplied by itself, it becomes smaller. If you have a base that’s greater than , you will have a line that will grow rapidly. But if you have a base that’s less than but still positive, it’s going to decrease or decay.